Toothpaste to whiten teeth. Toothpaste for sensitive teeth. All natural toothpaste. Shelves are stocked with every kind of toothpaste imaginable and then some, each one claiming to solve a different oral problem – problems that you might not even know exist! With so many options available, it’s easy to get overwhelmed. To clear up your toothpaste options, Bondi Dental has created this simple guide to help break it down for you. Before toothpaste people used pumice, eggshells, twigs and even just their own fingers to clean their teeth. Up until 1850 toothpastes were powders that contained soap and chalk – now they are made of more gentle and safe ingredients! Seaweed gives modern toothpaste the consistency it needs to be squeezed on your brush. And, of course, modern flavouring can help toothpaste to taste delicious! Brush every surface of your teeth, and don’t forget your tongue! Consult with Bondi Dental to ensure that your toothbrushing technique is good! Fluoride is extremely important and has helped dramatically reduce tooth decay over the past 50 years. Fluoride protects the enamel of your teeth from naturally occurring acid in your body. It’s important to use fluoride toothpaste even if you have fluoride added to your tap water. Studies show it makes a big difference in reducing dental caries (cavities). The name sounds fairly self-explanatory. Toothpaste that whitens your teeth, but how does it work? Teeth whitening toothpaste contains bleaches and abrasive ingredients, such as silica which scrub the surface of the teeth. Some brands of whitening toothpaste, however, can sacrifice general tooth well-being for the whitening effect. These toothpastes tend to be abrasive and only work for surface-level stains, not reaching deeply or changing tooth colour. For a more efficient and complete teeth-whitening treatment, ask Bondi Dental about our in-office or convenient take-home teeth-whitening kits! As its name indicates, tartar-control toothpaste helps prevent the buildup of tartar – hardened plaque. While this product is helpful in slowing new buildup on teeth, a professional dental cleaning at Bondi Dental is the only way to remove existing tartar and the bacteria it harbors. There are many causes of tooth sensitivity and two ingredients – strontium chloride and potassium nitrate – have been recognized as effective treatments for sensitive teeth and gums. When used as directed, these substances can build up blockages between the tooth’s surface and inner nerves. Though these toothpastes can be effective, relief may take some time as the blockages build up. In addition, those with sensitive teeth, or those who are prone to canker sores, should generally avoid toothpastes containing sodium lauryl sulfate. And, of course, if your teeth are sensitive, see us at Bondi Dental to get it checked out! These come in variety of flavours that children actually love – it is important to let your child choose the flavour they prefer, as this is associated with better brushing habits that will protect their teeth for a lifetime. 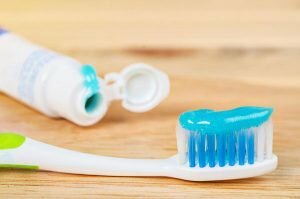 Usually these types of toothpaste are made of milder ingredients – they contain less abrasive agents and low or no fluoride for safety if the paste is swallowed or eaten. Fluoridated toothpastes are not recommended for children under the age of 6 if they cannot reliably spit out the toothpaste and swallowing a lot of fluoride is not recommended. However, if your children do have good brushing habits, fluoride can be safe and effective. Ask your Bondi Dental dentist or staff-member about this, if you are concerned. Foams, liquid-calcium concentrates, healing formulas, botanicals, no rinse formulas, gel/paste hybrids, and anything else you can think of are also available if you like to be different. At Bondi Dental we don’t recommend anything that seems gimmicky or too good to be true. If you have any questions about toothpaste, toothbrushes, or your toothbrushing technique, just give us a call at Bondi Dental and we will work with you to make certain you are using the right tools and techniques. The teeth you save today will stay with you for many tomorrows! We have extended opening hours for your convenience!